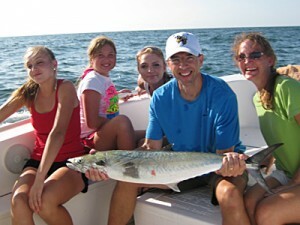 If you need an expert fishing guide in Pensacola, Florida, you need Bout Time Charters. We have the experience and equipment any angler needs to have a great time in the Gulf of Mexico. 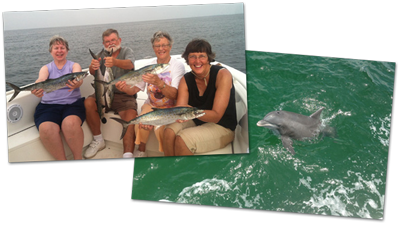 Whether you are a first-time angler or have years of experience, Bout Time Charters is your best bet for an unforgettable fishing charter. We run a variety of vessels, new for 2018 is our new Blue Wave 2400 Purebay with a 300hp Yamaha motor! This boat is the same size as our old 2006 vessel, but with a lot more room to fish! The Daiwa Guide Service Program sponsors our inshore fishing charters, allowing us to use the latest and greatest Daiwa rods and reels. 24 ft ’04 Everglades fully equipped – a first class ride! Rods, reels & trackle. Including top of the line Daiwa equipment. Full refund will be provided if you cancel your trip with 72 hours of departure time. Cancellations made within a 72 hour window can receive a credit towards future fishing trip. Cancellations made within 24 hours of departure time will be charged full amount of charter. Have a younger family and not sure if everyone will LOVE fishing like you do? Book an “INTRO to Fishing” trip with us. This is a special THREE HOUR TRIP (this works well for younger children) and we’ll teach you the basics of fishing and make sure the kids catch fish they can reel themselves and have a great sense of accomplishment AND reel in enough fish to wear out their arms! Call me for details on this trip. Not everyone in your family itching to go Inshore fishing? Pensacola offers countless breathtaking sights for you to view during one of our professional tours. Fort Pickens, Fort McCrae, the lighthouse and Naval Air Station Pensacola, the Sugar Bowl to the east of Pensacola Beach – a cruise to Lulu’s in Orange Beach! Watching a great sunset and watching dolphins play! There’s a lot to do on the waterways of the Pensacola area. Sometimes it’s too hot to be on the Beach Blue Angel Weekend. You know when they have to clear the water for the show to start. Try watching the Blues from the best seat in the house – OUR BOAT! And a Captain makes the BEST designated driver! Book us for a Blue Angel show! It’s lots of fun to be in the middle of the action off the beach in the gulf OR we can go to where the real party is in the Sabine!